I am emailing to enquire about what we need to do to attend The Australia Day Meet? I have sent our (Bruce and myself) membership application forms as instructed by your website. 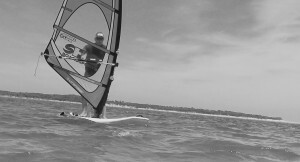 We would love to attend the day as beginners and give Windsurfing an attempt. Whilst our Australia Day meet is not a Come and Try day for beginners we are more than happy to organise time for you and your partner during processions to give windsurfing a try. It will be great to see you on Australia Day and look me up when you get there. I will be the one wearing the colourful Mexican straw hat. If you have a wet suit(depending on temperature) and a life jacket that would be good. Wet suits can be hired from Serious Stuff Surf shop in Inverloch. If you cannot access a life jacket we may have a few spare ones around club members. We will be operating out of the Angling Club car park near the end of Cuttriss St. Drop in from 10am. I am planning to visit Inverloch this weekend with my family. This will be my first time and would like to do some windsurfing. Could you please give me some recommendation of safe spots, calm water for a late beginner. I also would like to give some lessons to my kids and my wife. Also, if yuo had any recommendation for caravan park or camp site nearby I would appreciate it. Hi I’m just getting back into sailboarding after a 20 year break. Gee the equipment is different and light. I have some new gear but a bit rusty particularly on the Gybe. A friend recommended your club. I’m keen, could i call down one weekend and see what you guts do?